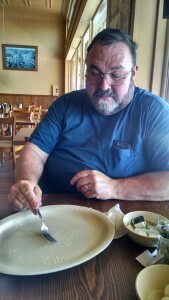 216 miles, from Shreveport LA to Vicksburg MS – 3609 total miles for the trip. highest temp: 95 but our weather app said the “real feel” was 105 and it “really felt” that hot. One new state, Mississippi, but no new license plates. 10 total states for the trip, plus I think we could see Arkansas from our most northern point today. Two new national parks: Poverty Point National Monument and Vicksburg National Military Park – 20 total park sites for the trip. about 12 – the number of different electronic and/or battery powered devices I worried about when a thunderstorm rolled through and knocked the power out at our hotel for a little while. 535 feet – the highest elevation above sea level in the entire state of Louisiana, near Shreveport where we started this morning. That’s about the same height at the top of the hill we live on in Seattle. 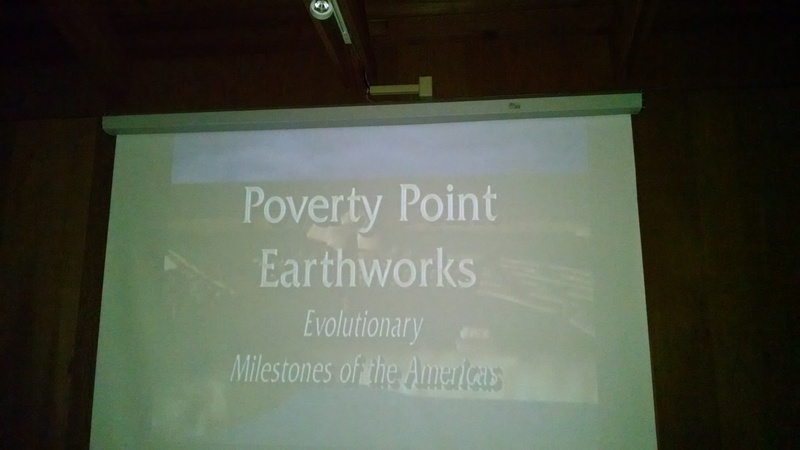 Poverty Point was the kind of National Park site I really love. All about an aspect of our nation’s history that I had never heard about before and all very well presented and preserved. We tend to learn in school about the early middle eastern cultures, like the Egyptians that we think of as early precursors to our modern culture. Here in Louisiana, at about the same time as the Egyptian pyramid builders there was a mound building culture that was probably the precursor to many of the later Native American cultures on this continent. 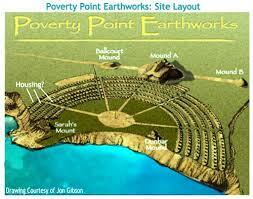 The Mounds they build were as high as 750 feet and huge. The major mound was in the shape of a bird though you can only tell that from aerial photography today. Yet these folks planned and build this and very intricate other patterns of mounds on which they both lived and grew crops without any way to see their work from above. Some sophisticated math was involved. The mound was built by carrying baskets full of soil from nearby areas up the mounds and building the structure layer by layer. With baskets of soil weighing about 50 pounds each the estimate is that it took about 15 million baskets full to build just the one mound. Also, the culture involved major networks of trade up and down the Mississippi, with rocks found in this area known to have originated as far away as Iowa, Illinois and even above the Great Lakes region in Canada. All of this occurred 2000 years B.C. I had no idea. Later generations of this same mound building culture built the Effigy Mounds in Eastern Iowa. 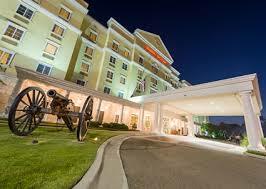 You can tell you are in the Civil War History part of the country when your hotel has a canon as a lawn decoration. We will see more of Vicksburg tomorrow, but one last tidbit related to elevation. All across Louisiana the entire state seemed very flat. Suddenly we cross the Mississippi and on the this side of the river the city of Vicksburg is quite hilly. In fact the cliffs by the river are about 300 feet high, one of the reasons Vicksburg was the last stronghold on the Mississippi for the South in the Civil War. 110 miles, from Natchitoches to Shreveport LA via the Oakley Plantation– 3393 total miles for the trip. highest temp: 97 and over 90% humidity for part of the day. no new states and no new license plates. One new national park: Cane River Creole National Historic Park – 18 total park sites for the trip. Visiting military bases is always an interesting experience. After living in Washington DC for 2 years we got used to the reality that security at every place is going to be different. At Lackland AFB we almost didn’t get in. 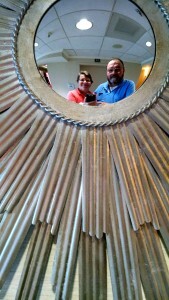 They usually required advance approval but a phone call to staff at the on-base museum and a 30 minute wait got us in. Here at Barksdale AFB, the guard met us at the gate asked for our driver’s licenses and then said to follow him in our car as he walked around the corner and pointed to an adjacent parking lot. He said we could park there, right next to the museum and he would keep our licenses until we were done. He was quite cheerful and noted that he was also from Seattle and promised us he would take special care of our licenses. It all worked out. The Cane River Creole Historic Area around Natchitoch es covers a lot of history but mostly a large number of old plantation sites in this area. We visited one specific site at the Oakley Plantation. This part of our country’s history is so sad. I have a hard time understanding the attraction that some people have to this era. Being here while so many conversations are going on about he confederate flag is very odd. The argument I have heard on news shows several times in the past week is that the Confederate flag is not about racism, it is about states’ rights. But I have to ask when I hear that phrase, “States’ rights to do what?” The civil war wasn’t fought over states’ rights to build roads, the right to provide schools or hospitals for citizens, or about how a state generally chooses to tax or spend its money. It was specifically over the “states’ right” to continue a system of support for one group of people to enslave another group of people and treat them as property. I don’t know if the confederate flag defenders don’t get that or if they don’t want to get that. The confederate flag is part of history but I have a hard time seeing how it should be the official part of any level of government anywhere in the currrent day United States. One other item we learned today was that there is a special food item we should look for while in this area: a Nactchitoches Meat Pie. The key thing to understand is that these meat pies are like Grape Nuts – They aren’t pies and they aren’t (usually) filled with meat. They are what we would call an empanada and are usually filled with crayfish. If we run across one I will report. The sky was beautifu l today as we just managed to finish our day before a thunder storm rolled through the area. 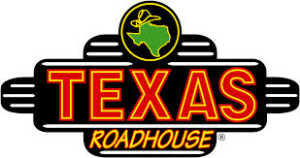 As we got close to our hotel I asked “Do you suppose they have any Texas roadhouses in Louisiana?” The next instance right in front of our h otel was this sign. We had a great dinner and I told the waitress I had only one complaint. Their prime rib is so good I can never bring myself to try anything else on the menu. 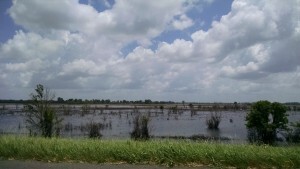 251 miles, from outside Houston TX to Natchitoches LA – 3283 total miles for the trip. highest temp: 90 and over 90% humidity for part of the day. elevation: rose to all of about 130 feet above sea level. Not going to report on this again until after we are out of Florida. 2 states: Texas and Louisisana: up to 9 total states for the trip. 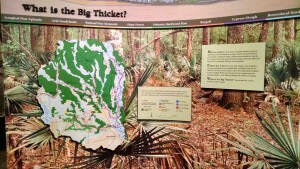 One new national park: Big Thicket National Preserve. – 16 total park sites for the trip. Even though it was hot and humid we were comfortable most of t he day traveling in our air-conditioned car. This part of the country is so lush and green. It is really quite beautiful. 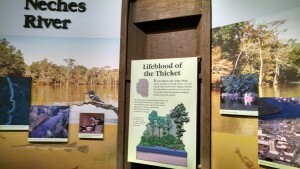 We learned at the Big Thicket that for many years the Thicket was home to relatively few people, but that they could live a pretty reasonable life totally in the woods. The area is full of such a diverse range of plants, trees, birds, insects and animals that resourceful people could live a very self-sustained life just from the resources around them. 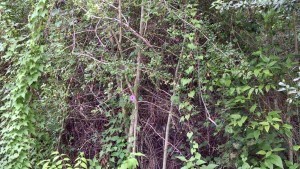 In addition to using natural items for food and clothing and shelter, many medicines could be obtained from the Thicket. My thought abou t the people living in the Big Thicket was that many of us today might look upon such an existence as a pretty low level hard scrabble way of life, but they definitely lived according to Milton Wrights advice. Not needing or expecting support or help from anyone else. Of course we do not live in a world where everyone ascribes to that approach. At the point at which it was realized that the Big Thicket contained Big Timber and Big Oil, then Big Money stepped in, booted out many of the people living there and just about destroyed this most amazingly diverse and intricately intertwined and balanced environment. Luckily before that happened, people with a longer view stepped in and set aside a small part of the original Thicket as a preserve. 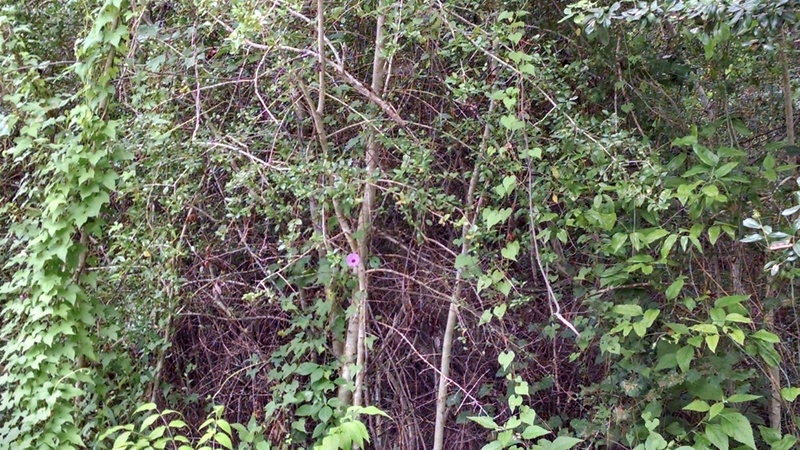 The story of the Big Thicket can also be seen as a allegory more generally for other issues in our modern world. See GracedMoment blog for today. The be st part of travels to new places, whether it be physical travels to National Parks, or intellectual travels to other places and times like 1903 at Kitty Hawk, is when we can use those new experiences to reflect on ourselves and what we can do to make our work a better place. 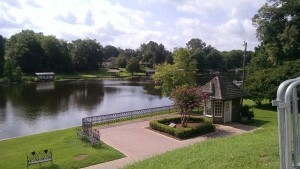 Tomorrow we will visit a part of the Cane River Creole National Historic Park and another museum in Shreveport LA. highest temp: 93 at about 3:00 then 71 at 3:30 and back to 89 by 4:00. Drove through a major rainstorm in between of the type we never see in Seattle. still at 8 total states for the trip. Licence plates spotted: New York and New Jersey – only 8 more to have seen all 50. Two new National Park sites: San Antonio Missions and El Camino Real de Tierra Adentro or the Spanish Colonial Royal Road. – 15 total park sites for the trip. One other Museum – The Lone Star Flight Museum in Galveston. When I find I have sort of overdone the number of museums I have gone to in a short period of time if feels like my brain is full and can’t hang onto anything more. That was me today at the San Antonio Missions. It seemed really interesting at the time but after the fact if you ask me what I learned it would be like the parents talking on a Charlie Brown cartoon. “Wa, wa, wa, blah, blah, blah. ” Hopefully I can reset and get ready for the rest of the trip. One more brain freeze event was at the hotel when I discovered that in addition to being red-green color blind, (to see if you are take this online test) I am also apparently HCAI (Hotel card arrow impaired). I could not get the room card to work no matter how I tried (we even had the hotel clerk make us new cards). I decided to try the card each of the 4 possible ways it could go in the slot only to be told on the last try that there was an arrow on the corner of the card to help guide you on how to insert it in the slot. When inserted with the arrow first it of course worked correctly. At the museum in Galveston, I pointed in one direction and asked for a suggestion on a viewpoint to see the Gulf of Mexico. I was informed that the direction I was pointing was not toward the Gulf. I got directions, which were actually helpful, but when back to the car confirmed my thought that we were actually on an Island at the time and technically any direction was toward the Gulf. After driving through the above mentioned rainstorm we spent some time at the seawall and beach area in Galveston. The scene reminding me of my first time ever visiting any ocean beach. At Christmas 1974 my cousins, Pete and Mark, took me with them to spend the holiday with their parents, my uncle and aunt Al and Edna, at their winter home in Brownsville, Texas. They taught me how to body surf in the Gulf on Christmas day. (The locals dressed in their winter coats thought we were crazy, but for us, coming from 20 below temps in Iowa, the water was warm.) I was later able to use my body surfing “skills” in both the Atlantic and Pacific Oceans. Thanks cousins for that memory. Onto a new state tomorrow, Louisiana. Zero: miles travels, new states, new license plates, change in elevation, or national parks. One: Very fun relaxing day, historic site, riverboat ride, and historic Supreme Court decision. We stayed closed to downtown San Antonio today. Had planned to drive to a few close sites, but after a very pleasant talk with the woman putting out the hotel breakfast items, and based on her advise, we left the car in place and walked. Visited the Alamo. Decided not to stand in line for 2 hours in the sun. I think there were more people at the Alamo than we saw in all of New Mexico. Could see most of it without the wait in line which was just for the church. A couple of thoughts about the Six Flags of Texas. First, they count the governments that ruled over this area: Spain, France, Mexico, Texas, the Confederacy, and the USA, but do not count the indigenous people of America who lived in this area for 1000’s of years before any of the other showed up. Maybe the native people should have thought to have a flag. 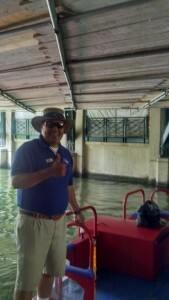 Meet, Joseph D. He was a our tour guide on a river boat ride around the river walk area of downtown San Antonio. Great tour, reasonable price, and great tour guide. We learned a lot and had many good laughs along the way. I hope Seattle can learn a few things from San Antonio as the city tries to figure out what to do with it’s waterfront after the viaduct comes down. Between Baltimore Harbor and the San Antonio river walk Seattle could learn some good lessons. Tomorrow, the San Antonio Missions and onto Houston. 126 miles, all in Texas from Fredericksburg to San Antonio – 2726 total miles for the trip. elevation continues to drop: down to 650 feet in San Antonio. Licence plates spotted: Alabama, West Virginia, and Minnesota – 40 total for the trip plus 3 Canadian provinces. One new National Park: 2 sites – LBJ National Historic Sites at both Stonewall and Johnson City, Texas. 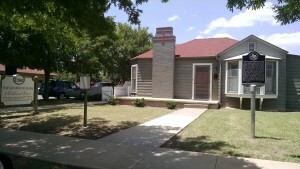 The Stonewall site includes President Johnson’s birthplace and ranch. The Johnson City site is a Museum covering an overview of his presidency. – 13 total park sites for the trip. One other Museum – The Airman Heritage Museum on base at Lackland Airforce Base. To my surprise I real enjoyed our time in the Hill Country region of Texas. Very pretty, reasonable weather, and many interesting places to go. I was very affected going to the LBJ national park sites. I always enjoy traveling to places where my ancestors lived because it gives me a feel for the what it might have been like for them to live in a particular place. Similarly there was something quite affecting about seeing and walking about on the same land and in the same house as this great historical figure. I know many people associate him only with the Vietnam War, but my connection to him has always been Civil Rights. Reviewing the many accomplishments of his presidency stands in sharp contrast to the past 15 to 20 years in our country’s leadership. His presidency was a time when the focus was on identifying problems and actually doing something to try to improve the situation. There were over 200 major national pieces of legislation put into law during his time, affecting civil rights, poverty, education, health care, the arts, the environment and much more. The author, Taylor Branch, whose 3 part series on American in the 50’s and 60’s is essential reading for any history buff has said that 3 pieces of legislation personally pushed through by Johnson made more of a change in our society than any other legislation in the past century: The Civil Rights Act of 1964 (marking the beginning of the end of official segregation in the South), the Voting Rights Act of 1965 (outlawing many of the practices used to keep Blacks in the south from exercising their fundamental right to vote), and the Immigration and Nationality Act of 1965 (which abolished the old explicitly racial quota system of legal immigration into this country). The first of those laws, as it applies to our nations schools and colleges, is what I spent the entire 34 years of my federal government employment working to implement and enforce. For me that law and subsequent additions which strive to ensure that everyone in this country has an equal assess to educational opportunities without regard to race, color, national origin, gender, or disability, are foundational to what is unique and great about our country. Obviously, I could go on but let me just repeat how moved I was to visit such well created and presented memorials to this man. elevations: from 2890 in Odessa to 1718 at Fredericksburg. 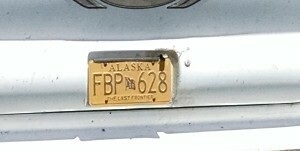 Licence plate spotted: Louisiana – 37 total for the trip plus 3 Canadian provinces. No new National Parks but a very interesting visit to the National Museum of the Pacific War. It was a very enjoyable day driving today. Drove through a town called Harper, Texas. I wonder which of my cousins might find that interesting? We spotted a place for lunch in Fredericksburg and found it to be a treasure of a find: The Old German Bakery & Restaurant. 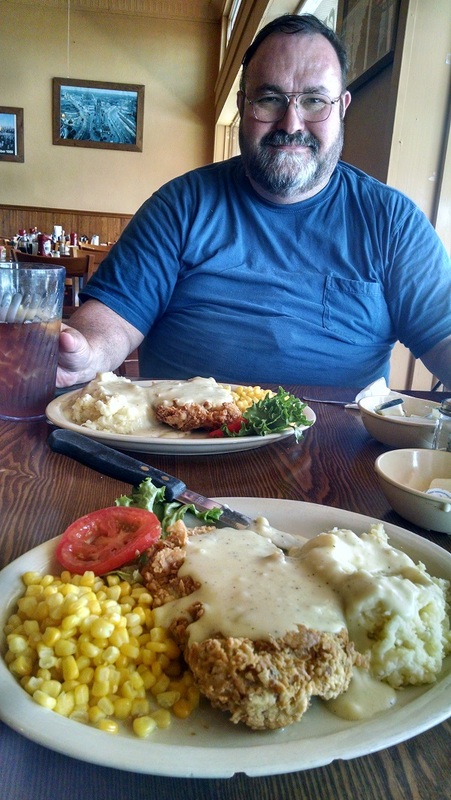 One of the things we always look forward to in returning to Iowa is finding a place that serves a good pork tenderloin, pork chop, or other pork dinner. Seattle has many good and varied types of restaurants but almost no German restaurants and very few that serve a good pork dinner. In recent times our favorite place to hit in Iowa is Darrell’s Place in Hamlin, Iowa a few miles east of Harlan. We love their famous pork tenderloin. All I will say beyond the pictures below is that Darrell better be glad Fredericksburg is a long way from Iowa. The Museum of the Pacific War was surprisingly good. I am enough of a history buff that I have been to a good many museums focused on many aspects of history, including all of the various Smithsonian Museums. This Museum was one of the most well planned and presented history museums I have ever been too. My particular interest was somewhat narrow. My father served in World War II, mostly in the states, and was part of the Medical Corp with the Pacific army on MacArthur’s late war return to the Philippines. I wanted to learn more about that part of the war and I came away with a much better understanding than when I went in. In addition, I found myself much more captivated by all of the rest of the very narrative displays which walked the visitor through from the 1930’s and earlier precursors to the war up to the post-war reflections of some of the leaders involved. For anyone with any interest in history I would highly recommend this museum. We spent over 4 hours there and were as filled as we could be with new information and insights. There was more to take in and we will return if we come through this area again. Tomorrow we visit the LBJ ranch and then move onto nearby San Antonio for a few days. highest temp: 91. – Coolest day of the trip – Also the first high humity -77% this morning. highest elevation: 3573 at Roswell where we started. Now at Odessa, TX = 2890 feet – I know people think Iowa is flat but there are many places much flater than Iowa and Western Texas is one of them. Licence plates spotted: 2 new states, South Carolina & Mississippi – 36 total for the trip plus 3 Canadian provinces. No new National Parks but 2 other stops. One Time Zone change from Mountain to Central. Remember to adjust your clocks. We continued listening to our Audio Book – The Wright Brothers written and read my David McCullough. Excellent book and a fascinating story. We thought we had already learned a lot about the Wright brothers from previous reading and from visits to their bicycle shop in Dayton, Ohio, the site of their early flights at Kitty Hawk, North Carolina, and many visits to the Smithsonian Air and Space Museum. However, the personal story told by McCullough is rich in details about the Wrights as people, much of which we had not heard before. Just one quote: When asked how to be successful, Wilbur wright said: “I would say choose good parents and begin life in Ohio.” Very humble advice. Related to the ability to choose your parents or your ancestry in general, today we drove past the childhood home of George W Bush. We saw a lot of presid ential homes when we were living in DC so are continuing to see others as we travel. In addition, George W is a distant cousin of mine. My only comment is that contrary to Wilbur Wright’s advice we don’t have any choice about who are parents or our blood relatives are. highest elevation: 6338 feet as we came into City of Rocks National Reserve from the North and West. 1 new National Park site: City of Rocks National Reserve – 6 parks total for the trip. This was a pretty amazing place. It was formed by a magma flow that pushed up to near the surface of the earth millions of years ago and cooled as Granite rock. Then over the eons the surrounding land was eroded away, leaving some amazing and amazing large stone structures. People traveling by between the 1840’s and 1870’s along the California Trail thought it looked like the remains of an ancient abandoned city and referred to it when talking to others as the Silent City. 1 major river crossed: That snaky Snake River – twice more. The entire Treasure valley area around Boise is basically a flood plain from the Snake River and is a very rich agricultural area. We drove past both Jerome and Burley Idaho where many of the potatoes you eat in the form of French Fries probably come from. Also today we crossed from the Pacific Time Zone to the Mountain Time zone. So those of you wanting to stay in touch with us as we are traveling adjust your clock accordingly. One last number for today – we listened to our first audio book of the trip – A spy/action thriller that wasn’t good enough to go into specifics. We have better ones on the iPod and I will report when we listen to a good one. Tomorrow we head south in Utah. Two parks on the planned list: Timpanogos Cave and Arches National Park. However, the Park service has an advisory out that temperatures are going to be at all times highs, possibly above 105, and they advise extreme caution for any hiking. So we may make our stops there brief on this trip and come back at a better time of year. highest elevation: 7380 feet at the Continental Divide on Highway 550. We drove for several hours at or above 7000 feet and then for more above 6000 feet. At Roswell we are down to about 3500 feet. I think the high altitude was harder on us than we realized. Of course its hard to tell when you also have temperatures near 100. We live in Seattle at an elevation of less than 100 feet, the highest point in the city is about 500, and the ski areas nearby are only a bit above 3000, so we don’t see 7000 feet elevation very often. The list of states still to spot in the order I expect to find them are: MS LA AL SC WV DC DE NJ NY RI CT NH VT ME MN HI – That last one might be a challenge! Nothing particularly exciting to report today. Listened to part of an excellent book but will report on that when finished. Feels like we are starting phase 2 of our trip. Phase one was mostly a scouting expedition for future trips through the Southern Rocky Mountain region. Today we are on the western edge of the middle part of the country. Saw a very pretty prairie sunset today. Different than the quick sunsets when you are in the mountains. Also, can tell we are getting closer to the south as we got our first “Y’all have a nice day” from a waitress. From here we are totally in parts of the country we have never been before. We have a long list of parks, historic sites, and museums we want to see. One last number: Our 6 year old 90,000 mile Prius is averaging 52.5 mpg for the trip. Well that’s all from Roswell – If we figure out what’s going on with the strange green light and unusual noises coming out from under the door down the hall are, we will let you know tomorrow.